There’s something really exciting about kicking off a new project, especially when it involves an integrated marketing campaign that spans across channels. It’s even better when that project involves a new idea that may just be getting off the ground. Who doesn’t want to be there from the beginning to look back one day and say “I was a part of that”? Let’s take this scenario further. Your digital agency is tasked with building an online presence for a brand new startup. You create a Facebook Page and begin building the brand’s following on social media. You also launch paid search campaigns and you begin the on-going process of search engine optimization to help the site get found. The end of the first month rolls around, and you need to give your client a report. You’re accountable for everything you did online and want to show not only website traffic but also activity from the Facebook Page. Ideally, you should present a comprehensive document that encompasses both Facebook and Google Analytics data. You’ll want to create a format that will become familiar to your client and a template that you can update each month to review progress on a regular basis. No worries. We’ve got you. In this post, we’ll go over how to build a combined template that ties together metrics across multiple sources, using Megalytic. As Facebook grew to become a dominating online destination for users across all demographics, you could almost hear the stampeding sound of businesses rushing to secure a foothold there. Facebook celebrated its 12th birthday this year, so by now we all have a better understanding of how to use it as a channel to drive business. Right? When marketing a brand through Facebook, it’s easy to get distracted by the ideas and the strategy. It’s easy to lose track of what ultimately matters for success. So what metrics do you want to point to when your client asks for a quick breakdown of how a marketing campaign is performing? The difference between being on Facebook and succeeding on Facebook is largely about identifying KPIs and framing everything you do, from posting to reporting, around those metrics. For a quick review, a KPI is a key performance indicator: a metric you choose to determine success for your marketing campaigns. Don’t focus solely on one factor; consider multiple metrics together. For instance, likes alone are far from the key to Facebook success. Think about how KPIs relate to your overall business goals. While direct conversions are the ultimate goal, Facebook is a prime opportunity for brand exposure and awareness. You want to make sure that people recognize and respect your brand online, and in that vein, willingness to share and engage with your content shows that people are noticing and interacting with your brand. Choose KPIs that you can benchmark against over time as they change. Your own historical data is the best place to look in knowing whether the numbers you see correlate to success. While the KPIs you choose to measure and report on may not necessarily be the same as another brand’s most valued metrics, we’ll cover some common KPIs for Facebook. While reviewing these, think about how these KPIs can correlate to your online business goals. Smart marketing means putting the right messaging in front of the right people. In order to do that, you need a thorough understanding of who your audience is, what matters to them and most importantly what motivates them. One of the most appealing facets of Facebook Advertising is the ability to gather that kind of data with some level of precision. When running Facebook Advertising, you can take advantage of extensive demographic information about potential audience members. Facebook lets you target by factors such as age, gender, interests, income levels, and others that aren’t as easily accessible in other ad platforms. You can even reach a specific audience who fits your target demographic but may not be searching for your products or services yet. Small and large businesses alike can find value in budgeting for Facebook ad spend to reach their audience in a cost effective manner. But how do you determine what demographics to target for your campaigns? Of course, you should talk with your client or team to get any information possible about current customers and desired customers. Ultimately, the right targeting relies on understanding the business, its goals and what qualities make for the best customers. However, beyond the parameters you have established, you should also look for new opportunities to include in your ad targeting. Evaluate who’s coming to your client’s website but also evaluate who currently likes and engages with your client’s Facebook content. By delving into existing Facebook Page Insights, you’ll uncover a wealth of potential demographic factors for targeting. The competition to be heard in social media can sometimes feel like you’re screaming at a rock concert. Even if you have something important to say, it can be difficult to get your voice heard. Your time on social media takes attention and resources away from other efforts. That’s why you need to know what posts are most successful at reaching the audience you intend to reach, which messages resonate most, and what content compelled people to take action. By paying attention to your results, you can ensure your future social media efforts are based on what you’ve learned is most effective. When you provide social media services and must report on Facebook performance to clients, you want to show more than high-level numbers. You need to account for what you posted and be able to analyze which posts had the greatest reach, and which posts drove the most interaction. Using the Megalytic “Facebook Posts Published” widget lets you see a table of your page’s posts over a selected timeframe, along with metrics for each. When spring comes around, you probably take some time to clean out your garage, sweep out the leaves, and take down the cobwebs. 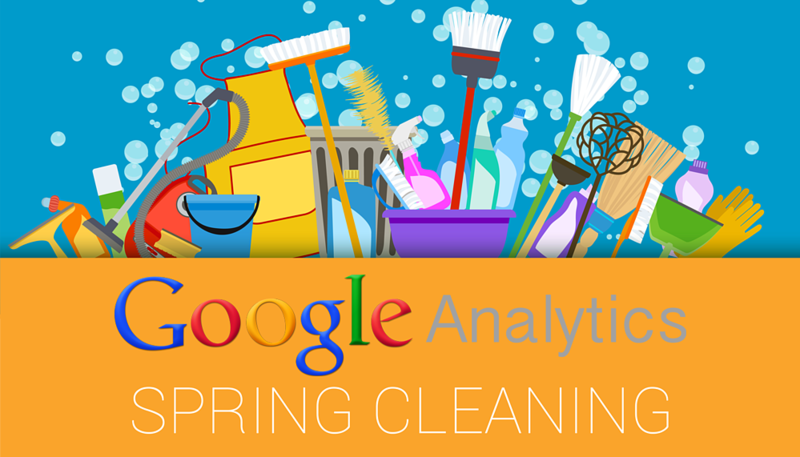 As a digital marketer, spring is also a perfect time to dive into your Google Analytics account to do a little cleaning up there. No matter how carefully you’ve set up the account, data tracking errors can creep in, and with a little tidying up, you can position yourself to measure your results more accurately. Let’s dive into a few items you can check within your Analytics account right now.